If you dug Joshua Budich’s previously announced New York Comic Con 2016 exclusive C-3PO and R2-D2 laser engraved metal prints then you’re going to really love this insane Captain Phasma print that was laser engraved on mirrored steel!!! What a perfect medium for everyone’s second favorite Stormtrooper in The Force Awakens. 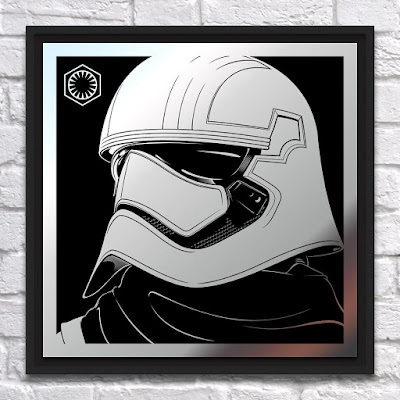 The New York Comic Con 2016 Exclusive Star Wars: The Force Awakens Captain Phasma Laser Engraved Mirrored Steel Metal Print by Joshua Budich measures 12”x12” and drops today (Friday, October 7th) at the Spoke Art NYCC booth #416.